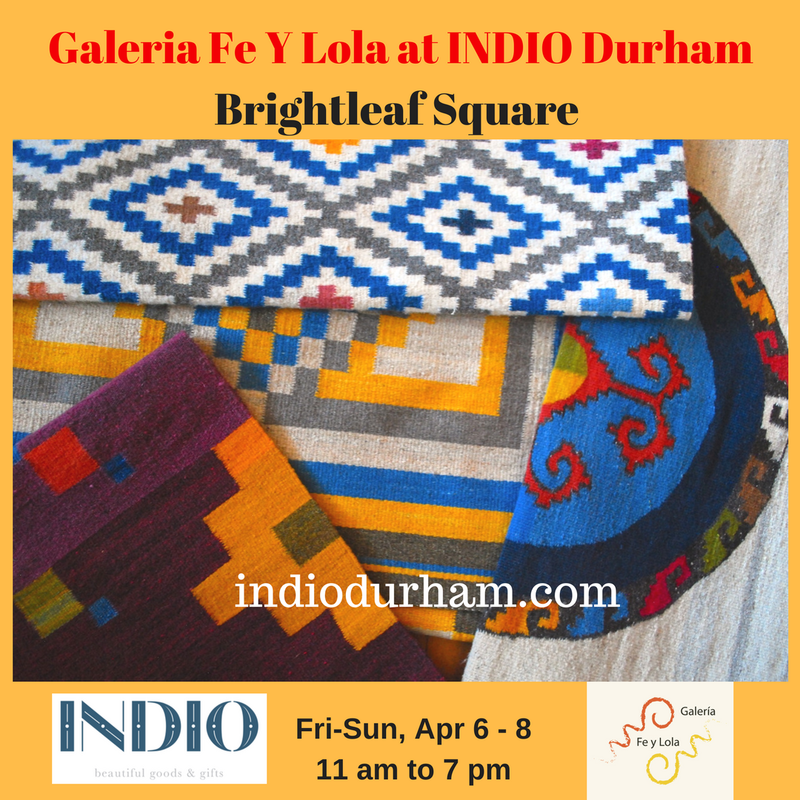 A snapshot of Galeria Fe y Lola rugs and tapestries on exhibition today through Sunday at INDIO in Brightleaf Square, Durham. 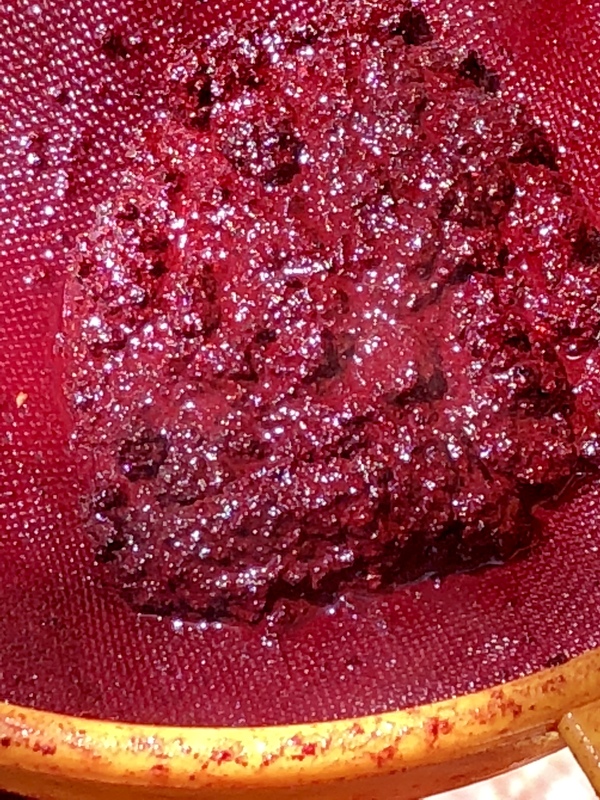 Color. Quality. Sustainable. 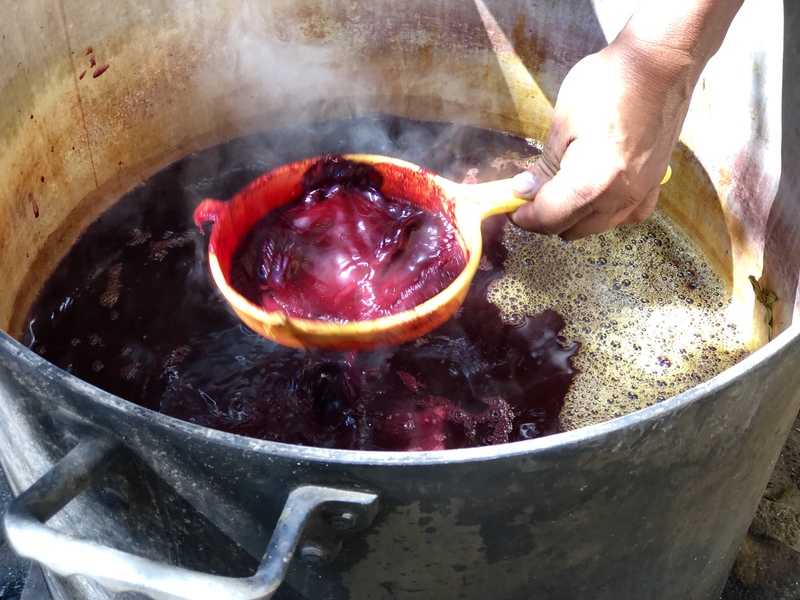 100% natural dyes. 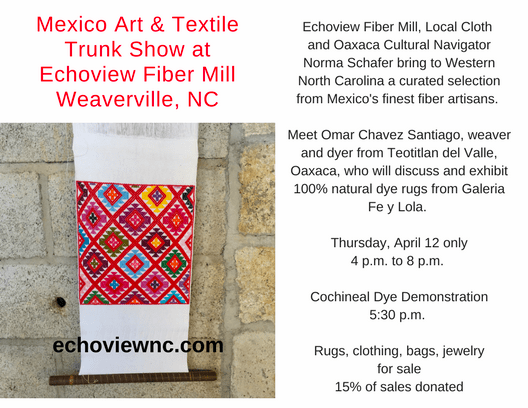 Meet Omar Chavez Santiago and hear about how they are made in Teotitlan del Valle, Oaxaca, Mexico. Please Share! 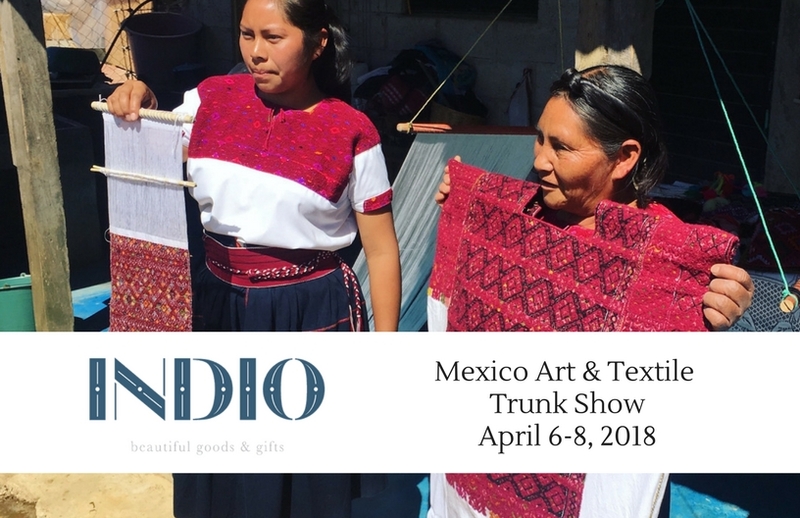 INDIO owner Wendy Sease recently traveled with me to Chiapas. She bought up beautiful treasures for her shop. 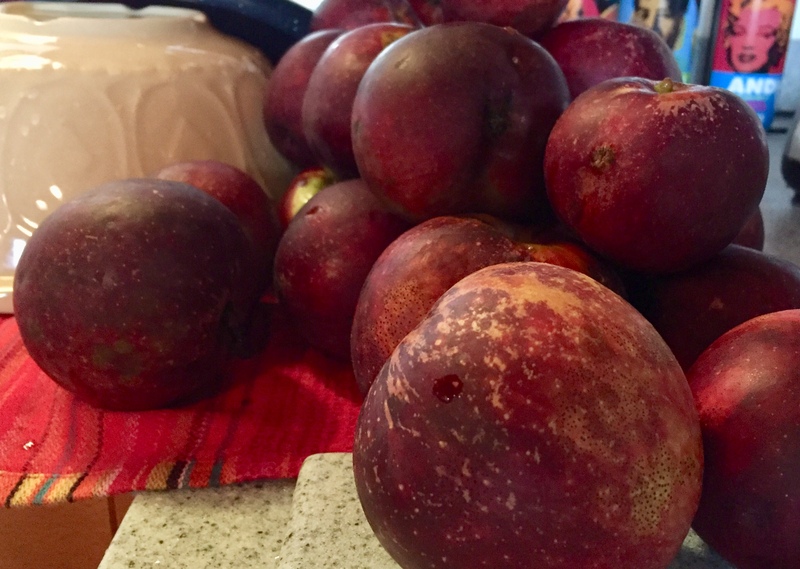 I’ve just returned to my apartment in Durham, North Carolina, for a couple of months with three suitcases filled with textiles and jewelry. We decided to collaborate. YOU ARE INVITED. Bring a friend. Plus, the BIG news is that my godson, twenty-three year old Omar Chavez Santiago, a recent industrial engineering university graduate, just received his FIRST 10-year visa to visit the USA. This is a really big deal, since the U.S. Embassy in Mexico City is pretty thrifty in giving visas. 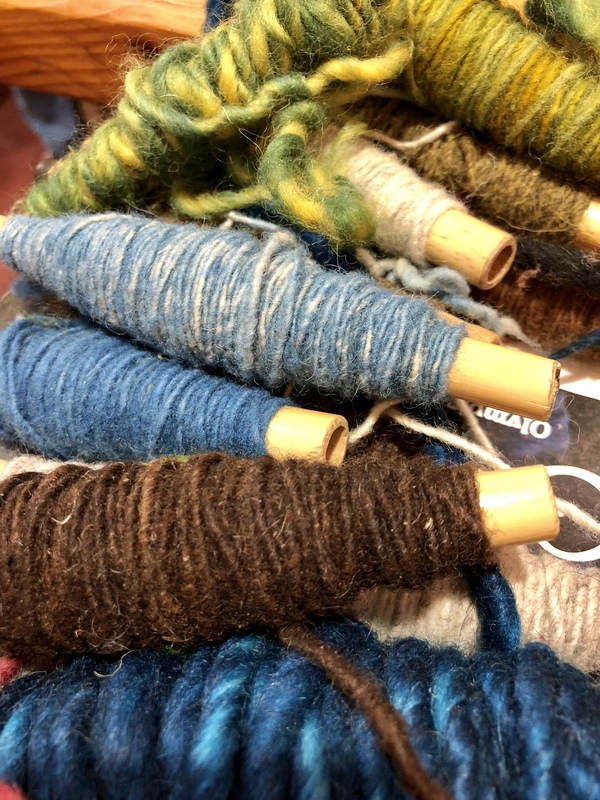 Omar plans to talk about the 100% natural dyes used to color the pure churro sheep wool his family at Galeria Fe y Lola uses in the rugs they weave and give demonstrations. He will have beautiful tapestry rugs for sale, too. They come in all sizes. Brick and mortar sales are hard for people who live far away. I know that. Look for a few pieces I’ll be offering online in the next few weeks, too. 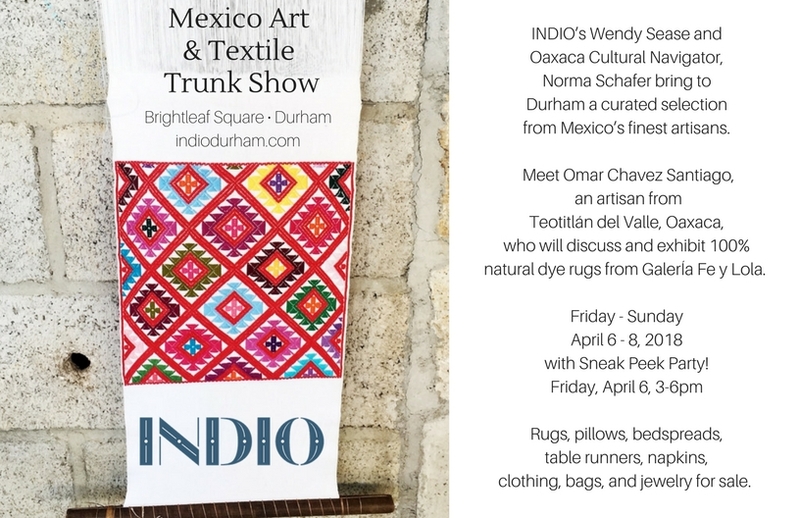 Durham, North Carolina is a long way from Oaxaca, Mexico — or so it seems. 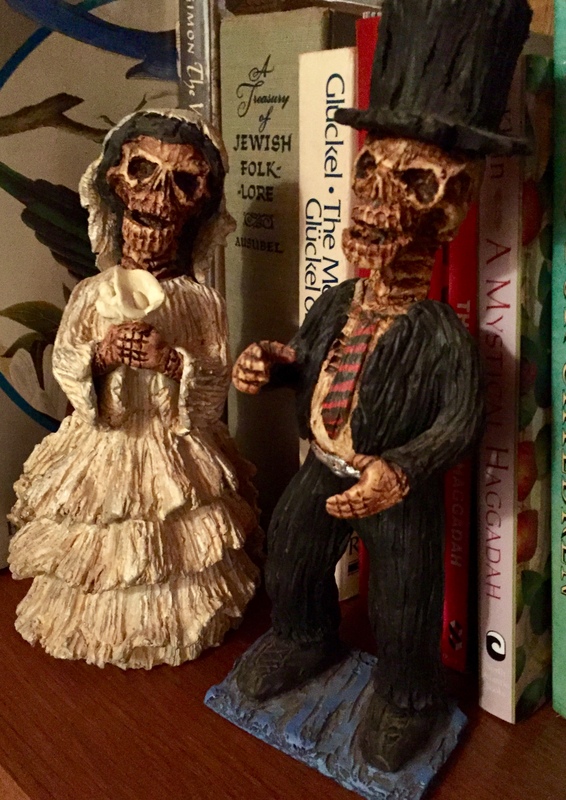 So many Latino families live in our region that while it is not as easy to construct a traditional Day of the Dead altar, it is not impossible. Recently, I discovered La Superior Super Tienda Y Taqueria in the Braggtown section of Durham, about two miles north of downtown on Roxboro Road. This supermarket is filled with almost every Mexican branded food you can think of. The fresh meat market stocks chicken, pork, beef and chorizo, plus chicharrones and other parts that Mexicans use in their cooking. The bakery is filled with Pan de Muertos (Day of the Dead bread), as well as concha rolls and other treats we only see in Mexico. The shelves hold Mexican chocolate (though not as good as Ernestina’s homemade Teotitlan del Valle, Oaxaca chocolate), and fresh and dried chilis and spices. It is heaven for someone like me. 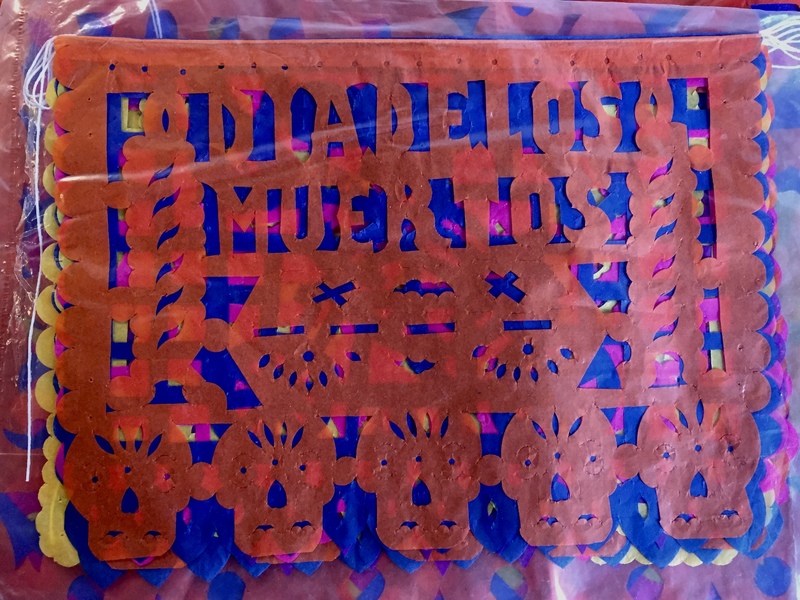 Oaxaca: The Day of the Dead from Bob Krist on Vimeo. Almost every town in the USA has some Latino people living there or nearby. 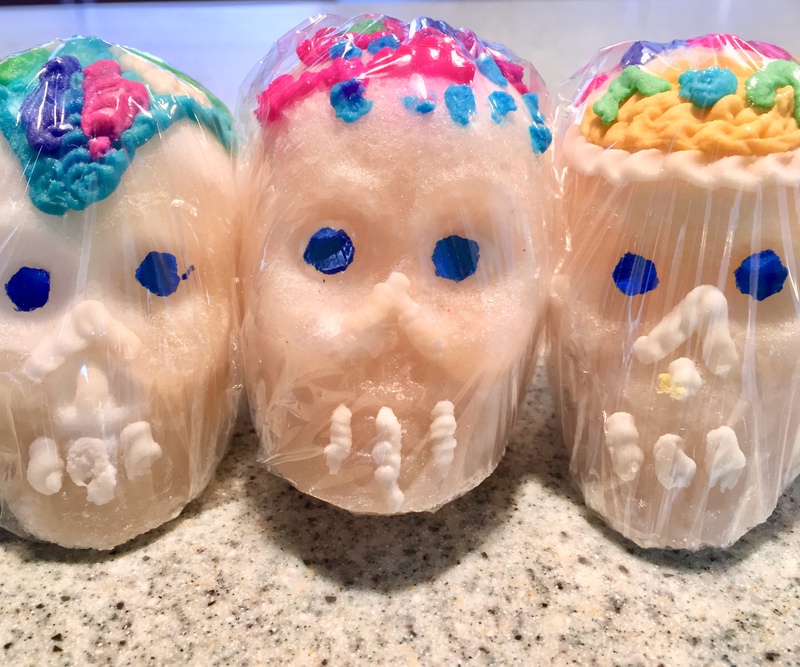 Hunt down the grocery store near you to get ready for Muertos. 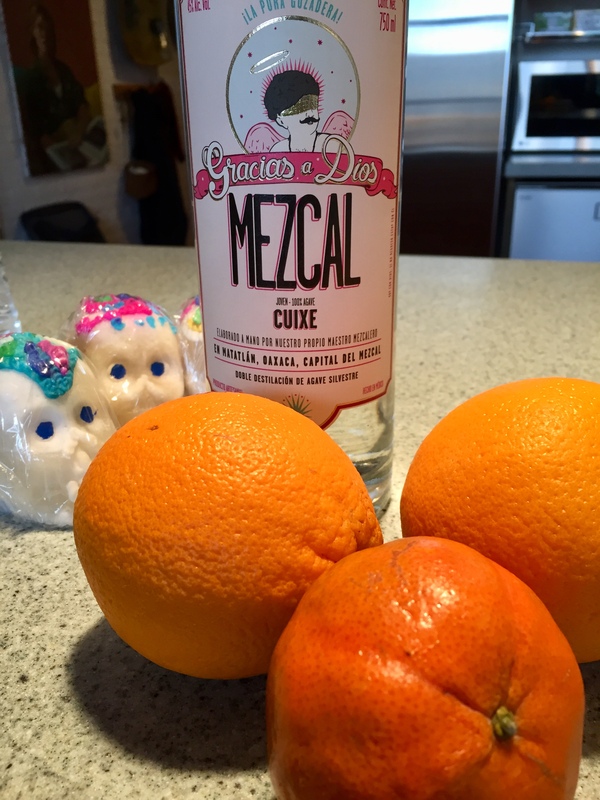 Mezcal and oranges are a necessity. In the neighborhood, while making at stop at La Monarca Michoacana for a traditional Mexican ice cream cone, I found the sweet shop next door, Dulceria Estrellitas. There, I was able to find sugar skulls and cacahuates Japoneses — Japanese style peanuts coated in a crunchy, spicy sugar-coating that Mexicans love. The dulceria is filled with party treats and everything Mexican kids love for stuffing birthday piñatas. After hunting around, I also found amaranth honey bars called Dulce de Alegria (or Alegrias), too. 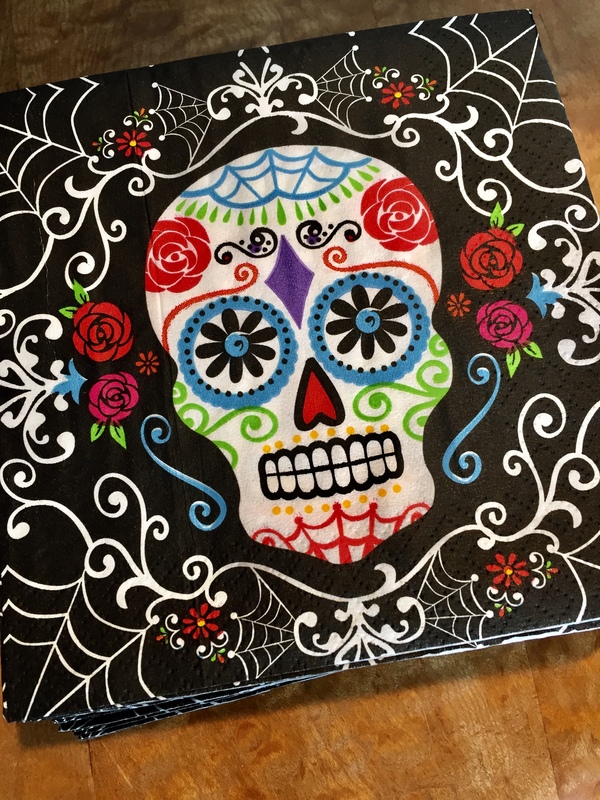 Then, I had to get onto Amazon to find skull design napkins, plates, and cups. Easy and fast delivery. To the altar, I’ll add fresh marigolds and small squash that I’ll get at the Raleigh farmer’s market tomorrow afternoon, plus photos of my mom and dad, my dad’s favorite beverage — a beer, my mom’s favorite beverage — tea. I’ll light the Teotitlan del Valle beeswax candles to illuminate the path to return for the visit, offer copal incense to guide them here. 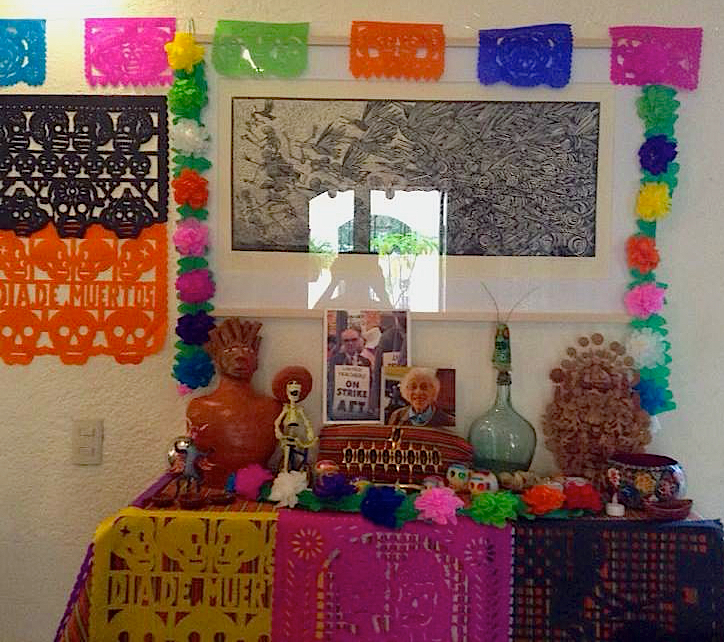 Muertos is a harvest holiday, a memory holiday, a time of honoring our ancestors. It’s pre-Hispanic roots harken back to a time before photos, when people slept on petate mats on the floor and altars were at ground level. 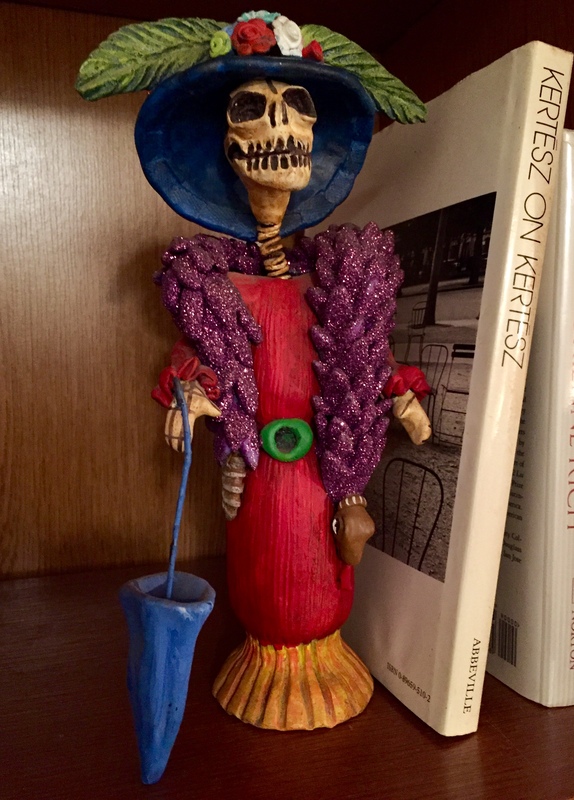 Muertos is not Halloween, although the Spanish attempted to meld it into All Saints and All Souls Day. It is not to be feared. Death is a circle, part of life, and all Zapotecs I know embrace it. 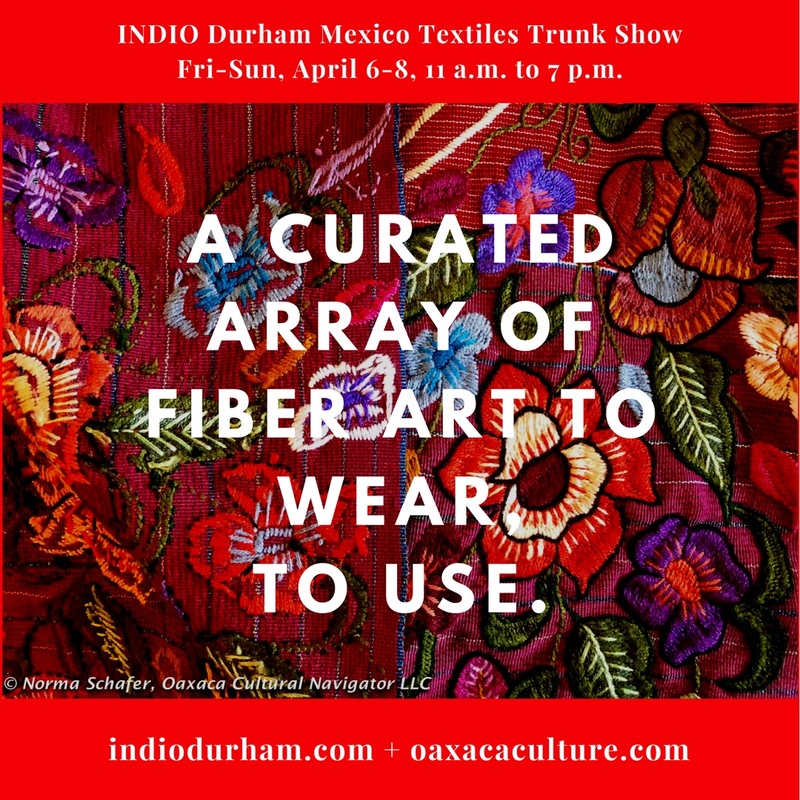 On November 2, when everyone is assembled at the Teotitlan del Valle panteon (cemetery), I’ll be here in Durham, raising a toast to life and its continuity. This is why I believe that Dia de los Muertos is universal, to be appreciated.